VIRAL TWEET: UTSA mom shopping at H-E-B plays wing-man for son, and it works! While shopping alone at H-E-B, a San Antonio mom seized a moment to play 'wing-man' for her college son. SAN ANTONIO — While shopping alone at H-E-B, a San Antonio mom seized a moment to play 'wing-man' for her college son. And the best part- it appears to have worked! 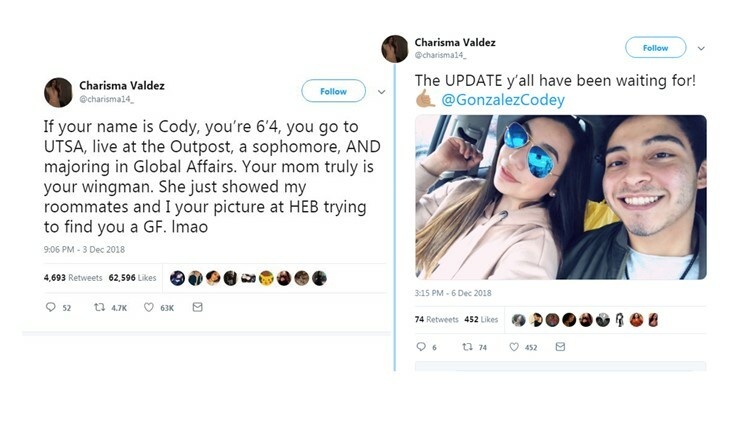 On December 3, UTSA student Charisma Valdez took to Twitter to share the hilarious story, writing, in part, "If your name is Cody, you’re 6’4, you go to UTSA...your mom truly is your wingman." In just a few days time, the tweet reached viral status, being liked more than 60,000 times. As the Twitterverse waited with bated breath, hoping for a love match made in grocery heaven, Valdez and Gonzalez were apparently having a first date. Valdez took to Twitter in the days following to post a photo of the pair, confirming their meeting, along with the caption, "The UPDATE y’all have been waiting for!" We wonder if their kids will attend UTSA one day?